Hello... Hello ... my old friends ... It's great to see you once again! 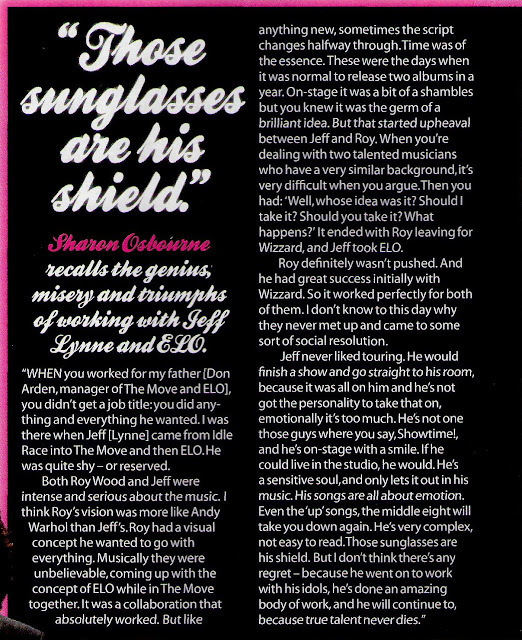 The above interview article is a small part of a fantastic six  page article which includes an exclusive interview with Jeff Lynne in the November 2012 issue of MOJO magazine and quotes Sharon Osbourne on the subject of the musical marriage between Roy Wood and Jeff Lynne that transformed The Move into the Electric Light Orchestra [ELO]. The issue also includes a short review of "Sportin' Wood" by The Flashcubes as well as a half page full colour advert for both "Long Wave" and "Mr. Blue Sky". MOJO magazine is published monthly and is available from all good newsagents and media outlets for just £4.60 or for a bargain annual subscription of £20 for twelve  issues.